tonight we had a quick quesadilla dinner before bran and i ran over to paint + canvas for an awesome painting class! i was going to throw some southwest salad on the side, but bran is not a salad fan, so i kinda went a little crazy with dips for the the quesadillas instead. this is option numero uno. i can’t give you my opinion on this dish because i am not a guac fan. you’ll just have to try it and decide for yourself. in a medium bowl, mash together the avocados, lime juice and salt. make sure to put the pit back in the bowl with the avocado mixture! per my dad, leaving the pit in the guac will keep it from turning brown. mix in onion, cilantro, tomatoes and garlic. refrigerate 1 hr for best flavor, or serve immediately. 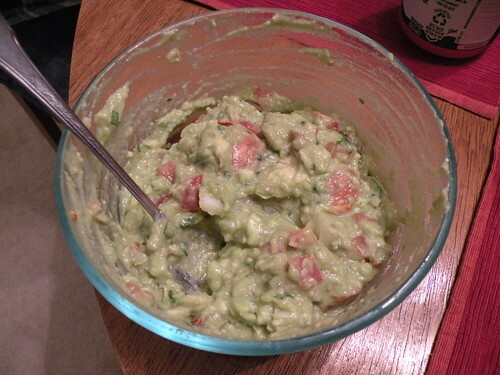 Wade made guacamole last week. It was really good. He mashed the onions and cilantro together but I like chunky avocados and tomatoes. He doesn’t like tomotoes or hot pepper so… garlic was a big plus. All in all his guac was pretty good! 🙂 We will try this recipe out too. Love ya!